A consortium of companies and organizations under the direction of animal feed producer De Heus launched the ‘Sustainable and Affordable Poultry for All (SAPA)’ project in 2015. This initiative was made possible in part by the Facility for Sustainable Entrepreneurship and Food Security (FDOV). De Heus has engaged Victor de Lange of CREM for the annual monitoring of this five-year project and for the final evaluation. The social objective of the project is the production of healthier, more sustainable and more affordable chicken for consumers in Myanmar. Chicken is the main protein source in the country. SAPA wants to break the current monopolies held by the large producers. The project focuses on two crucial links in the value chain: corn production (as chicken feed) and hatcheries. By actions such as training farmers, the project is trying to make corn production more sustainable and improve the quality of the corn. Through a new sustainable hatchery and the training of chicken farmers, SAPA wants to minimize the mortality of the one-day-old chicks and prevent the use of antibiotics. The hatchery is being built by Bel Ga Myanmar, a joint venture between De Heus and Belgabroed. CREM first developed a Logical Framework to ensure the systematic monitoring of the project, which consists of a coherent overview of project assumptions, activities, outputs and outcomes. After that, in December 2016, the first monitoring mission took place. In addition to examining the project process, this mission looked at the possible side-effects of the project, both positive and negative. 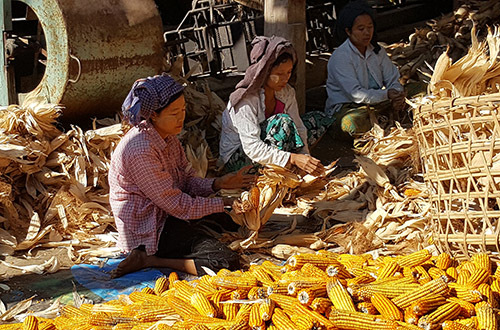 Based on the findings, options were found to increase the social impact of SAPA, including in relation to the working conditions of employees on the corn and chicken farms. In 2017, the feasibility of these options will be assessed. For more information: Victor de Lange (v.delange@crem.nl).